Had a lot of potential at the start, but didn’t deliver . . .
second guessing who the real good guys/bad guys were. Reminded me a lot of Stephen King’s The Mist to be honest. But then we hit about the three-quarters mark and I literally went WTH happened? The story slipped into silly mode and I found myself totally turned off. I don’t know, maybe I expected too much from an apocalyptic horror story, but I felt this could have been so much more than what it turned out to be. Comedy is not what I search for when choosing a “horror” story, but comedy is what it morphed into. It’s like the author did this bang-up job of setting up this dark tale and then totally dropped the ball. 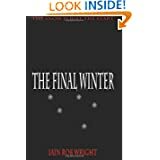 I might try a second novel by Iain Rob Wright just because I liked the set up of the first half in The Final Winter, but right now it’s a mighty big IF. The talent is there to produce a good horror. He certainly caught my attention at the start. But I think this one got pushed through while still in need of a lot more work in the developmental, editing, part of the writing process. Had potential, but didn’t deliver. I should probably have given it one star, but decided to go with two only because of the good beginning. For the author, because I feel you have a lot of talent as a writer– I’d pull this one and rework it before anymore damage is done. For potential readers—probably not going to be the story you hoped for when glancing through the blurb and those beginning pages. Posted by Denna Holm on July 29, 2012 in Archives and tagged angel, apocalyptic, fire, Horror, Lucifer, punishment, tense.